On a blistering weekend where the soaring temperatures had most Baltimoreans in cool cotton shirts, Pratt Street was awash with thousands of people wearing colorful wigs, full-length gowns and paper mache armor. The occasion – for those old enough to remember watching Speed Racer – was Otakon; a convention for fans of Asian pop culture. Now in its twenty-second year, Otakon is the largest and longest-running Japanese animation (anime) convention on the East Coast of the United States. The festive event which draws people from all over the world, has been held at the Baltimore Convention Center since 1999. Otakon originally began as a get-together for aficionados of anime, but over the years, it has expanded to include fans of all Asian culture entertainment. 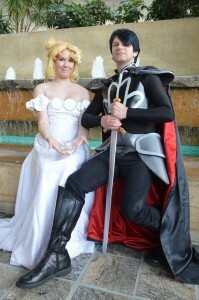 Many who attend do so in costume, or “cosplay” their favorite anime characters. Philadelphia photographer Julie Maxwell and her friend Timothy were two of the many costumed attendees on hand. Timothy donned a long flowing blue wig to cosplay Ihadurca from Evil Zone. Julie opted for the delicious but dangerous look of Seong Mi-na from Soulcalibur. Pausing briefly to regain her equilibrium after posing precariously for countless fan pictures, Julie told the Baltimore Post-Examiner the cosplay is not only an extension of her love for anime, but also her love for Japan. Julie said she was very disappointed to learn that Otakon will be leaving Baltimore in 2017. Organizers say the event has simply outgrown the aging Baltimore Convention Center. Allegheny County, Maryland residents Courtney Bass and Steve Brehm are both longtime fans of Otakon. 2015 marks Courtney’s twelfth year at the event. For Steve, it’s his nineteenth Otakon. What draws the couple to Baltimore for the annual celebration? Steve echoed Courtney’s story, saying that he too became interested in anime while watching the stylish Japanese cartoons and playing video games. “Watching the video games was a big part of it. When I realized that the games I enjoyed came from Japan, and that the cartoons I watched looked like the games I played, I thought, ‘Wow, that’s cool!’ So I just started coming to Otakon with my friends. Given their obvious enthusiasm for the genre, we wondered if the couple had met through gaming or their mutual love of anime? As veterans of Otakon, the couple admit that what they get into depends on the year’s programming. One of the highlights for Steve are the Friday Night Fan Parodies. For Courtney, Artist Alley is always a must-see. When asked about the impending move to DC in 2017, Courtney said, “I’m gonna miss coming to a building where I know where everything is. Steve said overall he thinks the move is a good idea. “This place has been way too crowded for the last several years, so I’m glad they are moving to the new venue. My very first Otakon, there were 1,200 people. It was held at a small hotel on the outskirts of Baltimore. It was tiny, but you had room to move around. Now it’s gotten huge and they have capped it at 35,000 people. I like that it’s big, because you’ve got more things to do; more events and guests and so forth. But it really has reached its capacity for the Baltimore Convention Center. Even with the crowding, we wondered what’s the one thing about Otakon which keeps Courtney and Steve coming back? Courtney was high on Artist Alley, so we took some time to wander the aisles of the artist hall. While many of the people we spoke with said they discovered anime as children or in their early teens, one vendor was selling a decidedly provocative series with a more mature – and timely topic. Dressed in a French maid’s dress with a heart on her cap and a pair of white rabbit ears, Darcy was cosplaying Sydney Bloom – the main character of the graphic zine. Just around the corner from the Chaotic Kiss display, we found artist K.S. Brenowitz busy with water colors. “I really didn’t know anything about anime until I hit high school, and became friends with a Taiwanese girl named Andrea. She would find anime on various artist’s doodle boards so we would watch it. I still have favorites from that time, like Darker Than Black, which was a series that I will always love. There is just such a variety with the kind of stories which are told in anime. I think that’s why it clicked for me. When asked about her own art style, K.S. replied, “I mostly work in pen and ink, and water color. I am also very well versed with dip pens for crowquill. That’s something you normally use quills for, but I prefer the metal nibs. I get a very lively line with that method, which is why I like it so much. I’m known for my cartoon characters with hyper realistic backgrounds and environments, so you have these sort of rubbery characters set in environments you can really sink into. Looking at a page of my comics, you probably see how I got the nickname, “The Masochistic Inker.” It’s kind of crazy. K.S. said she originally lived in Charm City but moved to DC for an assortment of reasons. However, she still participates in a group which meets regularly in Baltimore. Despite the heat and long lines, most of the participants we spoke with felt Otakon 2015 was a resounding success. 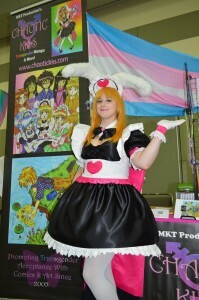 For those interested in learning more about anime and cosplay please bookmark Otakon. And for the very latest on gaming, check out Lynn Bachman’s blog exclusively at Baltimore Post-Examiner. 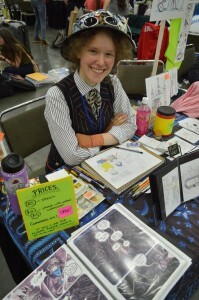 This reporter also sat down at Otakon with anime voice artist Kaiji Tang. Look for that interview in our sister publication, the Los Angeles Post-Examiner. In the meantime, enjoy this classic anime cartoon!